SonoSite ultrasound systems were originally designed for the military, which is why battle-grade durability is built into every system we make. 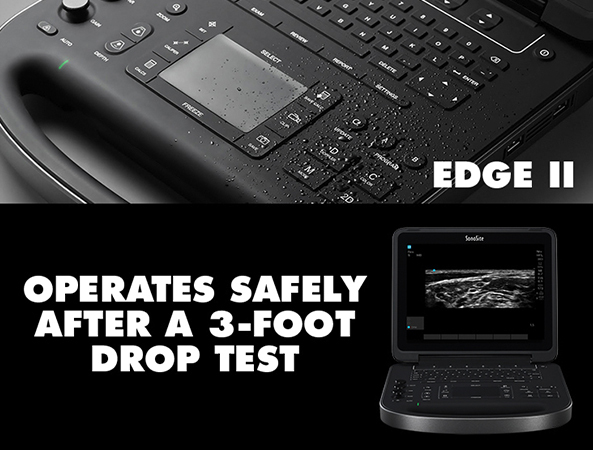 Our SonoSite Edge II doesn't just meet military specs, it exceeds them. We drop it, bake it, shake it, and test it under the toughest conditions to make sure it meets the standards of SOF medical providers. Watch the video below to see how we stress-test our systems to make sure they are ready to help clinicians like you make time-critical medical decisions wherever you are. Visit SonoSite at booth #1123 at SOMA19 and demo the SonoSite Edge II. Not at SOMA19? Request a demo by filling out the form. Fill out the form and a SonoSite ultrasound expert will contact you for an online or in-person demo. FUJIFILM SonoSite, Inc., will use the information you provide here to put you in contact with a sales representative. FUJIFILM SonoSite, Inc. will not use your contact information to communicate with you for other purposes without your consent. FUJIFILM SonoSite, Inc. the SonoSite logo and other trademarks not owned by third parties are registered and unregistered trademarks of FUJIFILM SonoSite, Inc. in various jurisdictions. All other trademarks are the property of their respective owners. ©2019 FUJIFILM SonoSite, Inc., All rights reserved.